Traveler Reviews for Private Tour in Athens, Attiki, Greece by Tour Guide Vassilios V.
Touring Athens with Vassilios is a must. I was truly impressed with the professionalism and warmth shared with our group and Vassilios. His knowledge and wealth of expertise made a very short trip to Athens memorable. Our day began with bring picked up in a luxurious Mercedes and being catered to for over 8 hours. Last minute changes were even handled. I looked at many reviews on this site and all I can say is that I'm glad I found and selected Vassilios and you will be glad if you select him also. I would definitely recommend Vassillos as a tour guide, he was excellent, very knowledgeable and so professional. He picked us up at the port and drove us everywhere in Athens, what a great experience!!! Thank you!!! 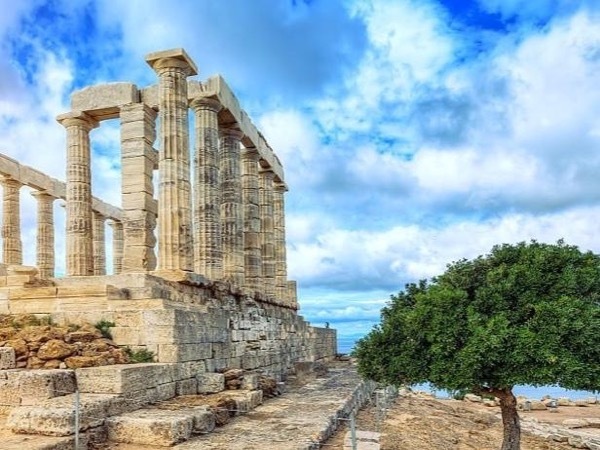 A truly memorable day savoring the flavors of Ancient and Modern Athens and its surroundings capped by a trip to Sounion and the Temple of Poseidon after a lunch by the Aegean Sea at an authentic Taverna, where freshly caught grilled Dorado was the star. Our ToursByLocals host: Vassilios is an exemplary Ambassador citizen devoted to his city, his country, its language and its impact on the rest of us. A Fountain of Knowledge: his keen observations and humor made for a uniquely unforgettable trip! Guide was prompt, knowledge, accommodating, had a great sense of humor and was highly regarded by the both of us. Continually asked if we had any questions and we would recommend him for a fabulous private tour! He did a fantastic job of representing Athens. Our tour was outstanding!! I knew Athens would be interesting, but our guide made our experience so delightful that I have to name Athens as my favorite stop on a 2 week journey. Not only did we see the usual highlights, but we experienced the local sites and flavors on our wonderful tour of the truly beautiful side of Athens. I had no idea of the incredible beaches and magnificent water vistas we experienced today. We also learned so much about life in Greece through our engaging conversations. We had a lovely day with Vassilios. His knowledge of the history and mythology or Greece was great and all his tips on how to view attractions were perfect. It was nice to see the area through the eyes of a local and take a drive through some of the back streets to see the real Athens. Our tour also included a drive to Sounion to visit the temple of Poseidon which included a drive along the Greek coastline which was beautiful. The local food was beautiful as well. Our guide took wonderful care of our needs and wishes - A wonderful day in a beautiful city. Everything promised and more! He is outstanding! Vassilios made our day in Athens very efficient and took us to many unique places that were not offered by the ships tour. His insight on modern Greece was also very insightful. TOUR GUIDE RESPONSE: Thanks a lot, hope to see you soon again (please copy and post again because you forgot to put STARS ! Vassilios is an excellent guide. He is very passionate about his country and its wonderful history. A lovely gentleman to spend time with. Booked Vassilios for Airport Transfer and 2 Tours for our short stay pre-cruise. We saw the main sights of Athens and then headed out of the city to Cape Sounion. Had a great seafood lunch on way back to Athens. The perfect way to spend our first day in Greece. TOUR GUIDE RESPONSE: Thanks a lot, hope to see you soon in near future again! The perfect tour guide/driver in Athens. "Bill" did a great job for us. He has a super personality and really knows the city. He arrived at our ship early and we discussed our plans for the day. As a result of his excellent suggestions, we changed our planned itinerary and got to see much more of Athens. I particularly appreciated his vast knowledge of ancient and modern Greece. We will definitely use him again when we re-visit Athens. Our first visit to Athens was made perfect with the help of Vassi! He not just drove us around but provided a glimpse into the amazing history of Greece! He was very friendly and made us feel like long time friends. Thanks for a great visit and hope to return! We did a full day Athens and Cape Sounion tour with Vassilios and had an absolutely amazing time with him! He loves his country so much and it is clear in the engaging way in which he conducts his tour! He is extremely knowledgeable and very engaging!!! He even had some thoughtful surprises for us which was very unexpected and added to how awesome this tour was! We learned so much and enjoyed an amazing meal and fell in love with Athens!!! Thanks so much Vassilios! You were a fantastic guide!!! TOUR GUIDE RESPONSE: Thanks a lot for everything, hope to see you soon again in near future Sincerely Vassilios V.
We had a lovely tour of Athens with Vassilios who took us round all the sights and explained a great deal about Greek history and culture both past and present. He emailed us when we booked leaving us a telephone contact, and when we got off the ship he was waiting for us as arranged. His English was perfect and we had a very enjoyable day. My daughter and I spent two days touring with Vassilios on this tour and the Corinth tour and were very pleased with his knowledge of Greek history and culture. He budgeted the time wisely so we had time for shopping and dining at fine Greek eateries while still visiting several different historical venues. I highly recommend Vassilios as an Athens-based guide - book your tours with him, you won't be disappointed! Vassilios was a great tour guide, with great information about the city's history as well as its current life, leaving us time to explore the Acropolis and the New Acropolis Museum on our own, planning our tour to get us to the changing of the guard just at the right time, and taking us to a great local restaurant. We feel like we made a new friend and hope to see him again for more! Vassilios is the most sincere and honest guide we have encountered, he is prompt, considerated and look after our interests (including our 5 year old) very well. He is personable, knowledgable and has great passion for his country, he is highly professional in his conduct, givining us the attention when required as well as leaving us time and space at the appropriate moment. Thank you Vassilios for a fun filled and educational in your beautiful city. Great guide and we would book him again. A new car and he gave us a cell phone that had him speed dialed in case we forgot where to meet him outside the acropolis. Great idea. A wonderful day of touring, and the local restaurant for lunch has this rolled baklava that I wish I had the recipe for. HE loves his country and that love is felt as you tour with him for the day. Vassilios was a wonderful guide. My son and I spent the day with Vassilios in Athens and had a fabulous experience. He was able to share his love for the city and knowledge of Athens. He was friendly, professional, and able to create the perfect tour. We have great memories in Athens thanks to Vassilios. I would highly recommend him to anyone considering a tour of Athens. Thanks Vassillios on behalf of my family and me. It was an incredible experience. TOUR GUIDE RESPONSE: Thanks a lot, hope to see you soon in near future again Sincerely Vassilios V.
My daughter & I have done many group tours and wanted something a little more personal during our trip to Greece. Vassilios went far beyond our expectations, taking us to places we would never have known to even ask about and giving us ideas about what to do on following days; all of his suggestions were just perfect. He himself was very knowledgable, personable, and entertaining. We both learned a lot & enjoyed ourselves thoroughly. We would recommend Vassilios to anyone and hope to tour with him again. Mr. Vassilios was at the pier waiting for us on time. Extremely affable, knowledgeable, funny. He drove us to all the important sites, took us to a local restaurant, and immediately became our friend. He knows his city and surprisingly many people know him. The day went by quickly and we were sad to say goodbye to our companion for one day! Well done! Vassilios was great and very helpful and knowledgeable about Athens. His knowledge of the city and its' back streets was amazing. TOUR GUIDE RESPONSE: Thank you very much, hope to see you soon again! Best Regards Vassilios V.
We loved Vassilios. He is definitely the man to go to for Athens! He loves his city, and he has unique insight into Greek history. He took us everywhere we wanted to go--all the MUST-SEES, but we also asked for a quick beach run, since there are some beautiful beaches in and around Athens. He took us to a fun, family beach and then to a traditional Greek restaurant. We couldn't have had a better day-- all in a cold Mercedes Taxi! Thanks Vassilios! We had a great time in Athens and visiting Cape Sounion where The Temple of Poseidon is located. Vissilios made it all fun and is just what you would hope for in a guide. He arrived at our hotel on time in his clean and smoke free Benz. His cold air conditioning was heaven sent on a 100 degree day. Lunch was at a locals lamb restaurant. The food was excellent. The lemon potatoes were superb! We spent 2 days with him & loved every minute! Do NOT HESITATE taking any tour with him. He tours from his heart! Vassillios has amazing knowledge of his country and made the trip educational for all. He adjusted to our needs given it was 100 F in Athens and we had a 7 year old and 10 year old with us. Highly recommend if looking for true knowledge and best views!